So, which is the better choice for you? To start, we have a chart that highlights some of the biggest differences, so that you can feel confident about your decision. If you want to learn more about what each piece of equipment offers, read on below! Sometimes referred to as "mini-tillers," cultivators are lightweight, portable lawn tools. These are the perfect pieces of power equipment for aerating garden soil and clearing weeds between established beds. Both electric and gas-powered cultivators are propelled forward by the cutting tines, which plow through dirt and soil. If you've got a small garden, either type of cultivator will help keep your beds neat and healthy. Instead of depending on old-fashioned oxen-power, garden tillers have powerful engines designed to break new ground. Front-tine tillers are typically less expensive. 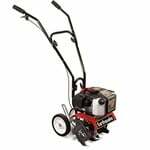 Although they can be used for weeding and blending soil in established garden beds, their engine power makes them better suited to breaking up ground in new, small garden plots with soil that tends to be sandy or loamy. While they aren't common, mid-tine tillers are the easiest of the three types to maneuver. Their engines are located directly over their tines, which distributes their weight in an evenly balanced way. This ease of use makes them a great choice for gardeners or farmers with large plots to till. Finally, if you want to break new ground on a plot with dense, heavy clay soil, you'll need a rear-tine tiller, preferably with counter-rotating or dual-rotating tines. Because they have tines that rotate in the direction opposite the motion of the wheels, these tillers can penetrate soil more deeply on the first pass. 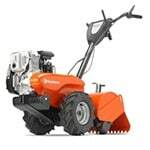 Rototiller Buyer's Guide - Find Out How To Pick The Perfect Rototiller. Our rototiller how-to library can help you pick the perfect electric cultivator, gas cultivator, front tine rototiller, rear tine garden tiller or garden tiller accessory.